In news that would normally annoy the UK’s rural-dwelling population who’ve long struggled with fast internet access speeds, Gigaclear has announced it will be offering a trial 5Gbps service from the start of next year. The reach of the UK’s largest broadband providers often doesn’t extend to some of the more rural parts of the country. Quite simply, the cost of rolling out a network isn’t viable when balanced against the number of potential customers, which is why you end up with government incentive schemes. Earlier this month, the government pledged universal download speeds of 10Mbps, regardless of where you live, by 2020. Gigaclear’s network is far more limited in its reach currently but does focus on some of those rural areas larger players decline to cover. As a result, where its service is available, it sees high take-up. On the downside, it’s currently only available to 10,000 homes and businesses, although it is still building out its coverage. Its current network is active in Oxfordshire, Kent, and York. The cost for such whopping download speeds, however, will be £299 per month (including VAT) for consumers and from £1,500 (excluding VAT) for businesses. 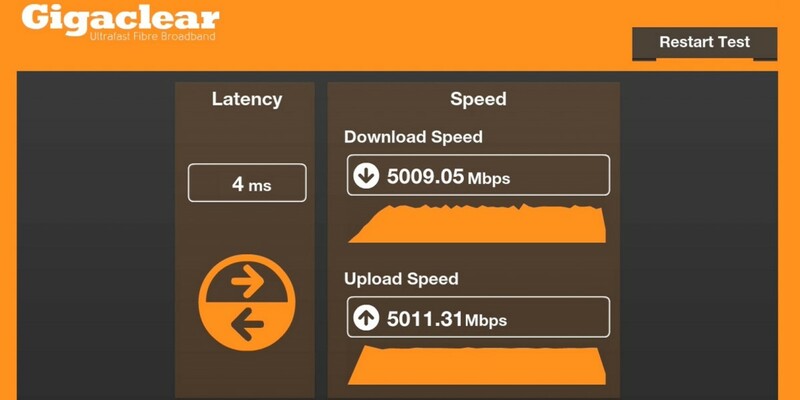 With 5Gbps, you could download a 1.5GB file in around four to six seconds, the company says. Presumably, you’ll be downloading a whole load of them to make it worth the £300 per month asking price. While this will present a somewhat better situation for some of the UK’s rural residents, the choice between slow broadband at a regular price and expensive but insanely fast broadband must be a tough one to make.